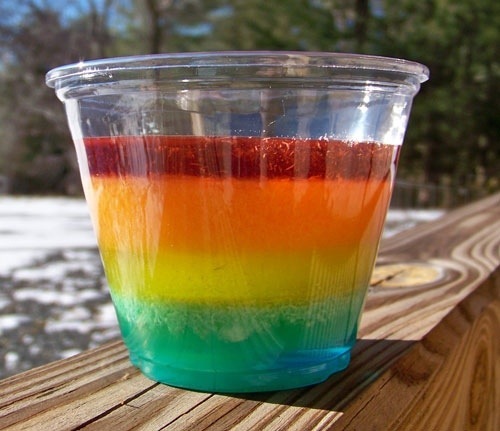 Who remembers rainbow Jell-O when they were a kid? I remember my mom making this dessert for every occasion from Thanksgiving to summer picnics. This was her go to item that everyone wanted her to bring. I decided to give it a try and see if my kids liked it as much as I did. While not overly difficult to make, somewhat time consuming to layer. Definitely don’t rush having each layer set or else they will merge together. The directions are really simple. My mom used to make hers in a 13″ x 9″ Pyrex dish. I made mine in individual plastic cups. I thought it looked more festive! Let me know how you make out? The kids will LOVE it, I promise.